Given my newfound liking of 180 quads, I’ve been racking my head about what would be the 180 quad best battery size. 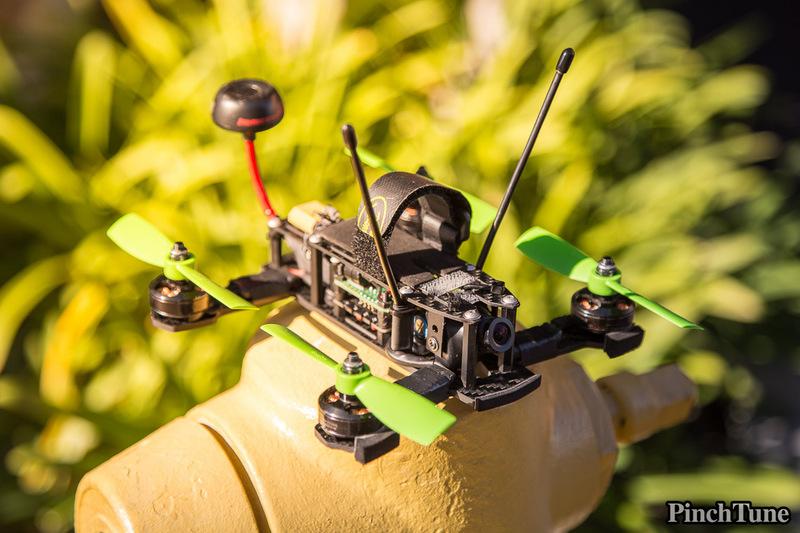 This is for a high performance FPV racing 180 mini quad. I first got into 180 size quads when a friend sold me his XE180 mini quad with Cobra 2204/28 2300kv motors and LittleBee 20A ESCs. 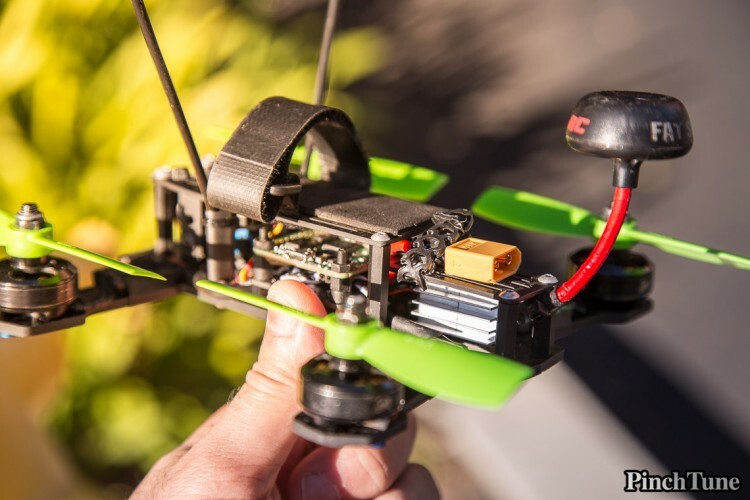 The XE180 happens to be a very light quad if built right. Mine is 275 grams without battery. At the time, I had a bunch of Turnigy Nanotech 4S 45c – 90c 1300mah batteries. I didn’t want to spend money on anything else so I decided I’d be flying those. And hey, I’ve had great success with them. I’m certainly not a Nanotech hater. They’ve been great to me. With the Cobra 2204 2300kv motors and HQ 4×4.5 Bullnose props or HQ 4x4x3 props I’ve been getting 6 minutes of flight time, pushing it hard, and I still come down with around 3.6volts per cell. On my 5 inch quads with the same batteries and motors I usually get 5 minutes and come down at the same voltage. This is with a mix of acro and fast racing lines. My Nanotechs are starting to age and I’m looking for more performance so I’m finally turning to supposedly better batteries. I’ve been looking at Gens Tattu and ReadyMadeRC’s new performance line of LiPos. 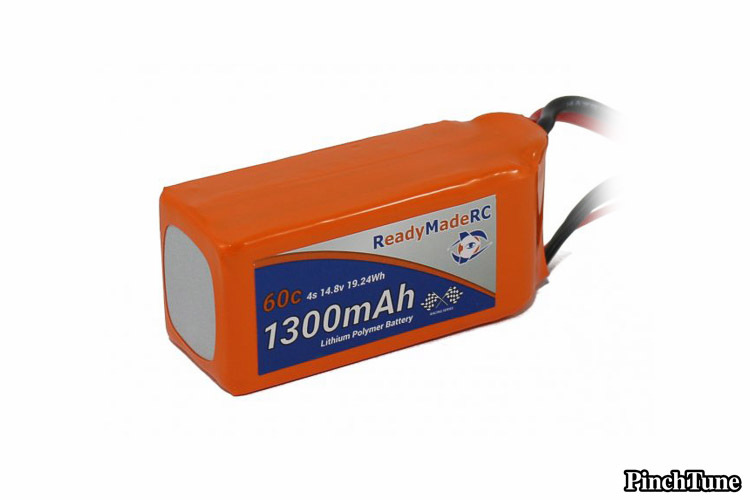 The 1000mah batteries would save me around 25g down from the 1300mah packs, with the RMRC 1000mah pack saving around 42g. These are all rough calculations since weights may vary a bit. My target C-rating target calculations are based on an estimated draw at full power of 65A from the Cobra 2300kv motors and 4x4x3 HQ Props. So. Target discharge rate is 65A. I know already that the 1.3Ah packs provide enough power. Not just because of the math, but also because I’ve been flying 1300mah packs. RMRC 1000mah 60C: 60A (5A short of my target). Now here’s the thing. I don’t buy into the whole 75C rating thing. I think almost all C-ratings above 60C are over-ratings. 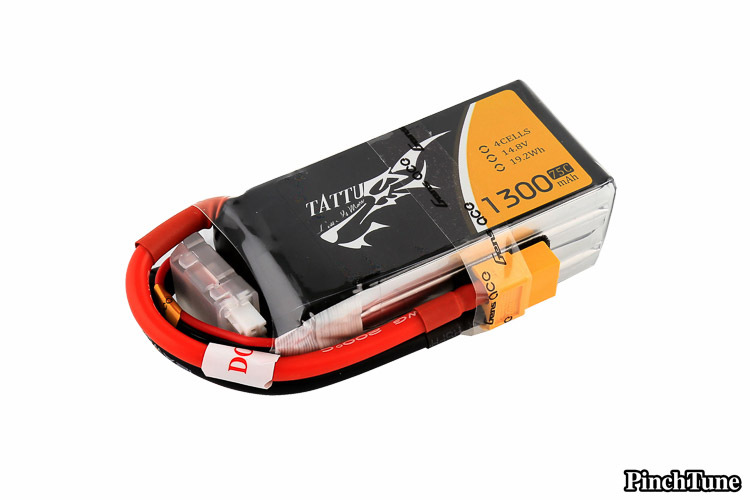 In fact, I believe the RMRC batteries rated at 60C offer the same performance as the Tattu LiPos rated at 75C. The Tattus have other nice features and what not, but rating-wise I believe they are around the same. This is from independent tests I’ve looked at online. What I’m trying to say is that I take those numbers with a grain of salt and only as loose rules of thumb. That said, both the ReadyMadeRC and Gens Tattu packs are known to perform better than Nanotechs which have fallen a bit behind in tech. So I’m on the right path. However, enter the Shen Drones Tweaker 180 FPV Addiction. After getting hooked on 180 quads from my buddy’s XE180, I decided to build one from scratch. Since I already had the lightweight build, I wanted to build something stronger and likely with better ESCs than the already great LittleBee 20A ESCs. Flyduino.net released the new KISS 24A ESCs and I ordered 5 of them (one spare) to go on this build. The Tweaker 180 FPVA is already a heavier frame than the XE180. It’s about 20 grams heavier. Add to that the slightly heavier KISS 24A ESCs and I expect this build to be around 25 to 30 grams heavier than my XE180. That’s where it gets tricky. I could get the lighter batteries and save that much in battery weight and be more or less equal to the XE180, but with the slight possibility of more voltage sag. Or, I could go with the 1300mah Tattu packs and have enough headroom to upgrade my props from the current HQ 4x4x3 props to the newly released HQ 4×4.5×3 Bullnose props (which by the way, are now in stock at RMRC as of this writing). It seems like I can’t go wrong either way. If I go with the smaller packs, I equate the weight of the XE180 and if I go with the larger packs I can make up the extra weight with more power from higher pitched props, but I might lose a little in handling. I’m a weight-weenie so this kinda means a lot to me. This all said, reading the forums, it seems that most people flying 2204 motors on 180 frames are flying 1300mah batteries. Only the ones flying 1806 motors or smaller 160 or 150 frames are actually flying 1000mah packs. This is from observations, of course there are exceptions. So there you have it. Conclusion: The scales tip towards the 1300mah packs for 180 frames on 2204 motors and 1000mah for 180 quads with 1806 motors. But remember, either way you can’t really go wrong. The trade-offs between those two sizes are not big. Hope this story helps make your decision a little easier.